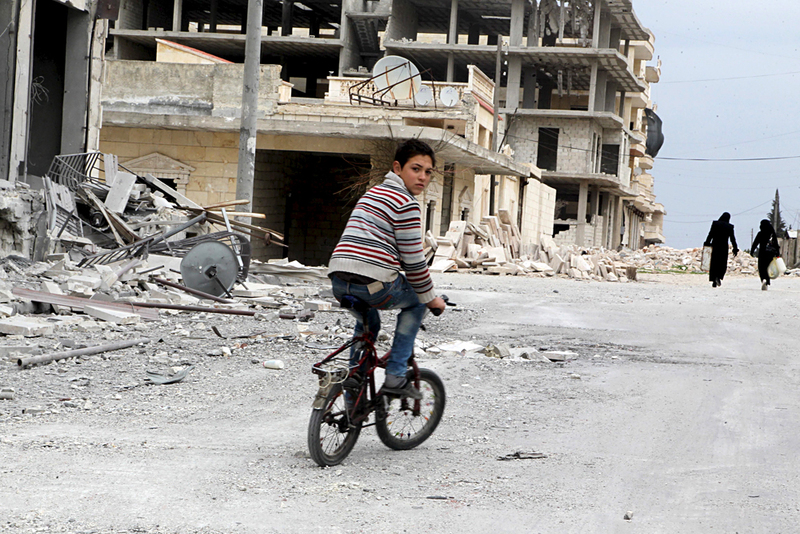 A boy rides a bicycle near damage in Kafr Hamra village, northern Aleppo countryside, February 27, 2016. In Aleppo, Syria, a truce has begun between the Syrian Army, the opposition and radical Islamists. The ceasefire, which was agreed upon by Russia and the U.S., went into effect at 1:00 AM local time on May 5. It should last at least 48 hours. According to Russian media reports, “relative calm” was seen after the official beginning of the truce between the army of Syrian President Bashar al-Assad, the opposition and the radical Islamists in the Syrian city of Aleppo. Despite the fact that a truce in Syria was announced as early as February 27, 2016 fighting continued around Aleppo. Damascus attributed it to the need to confront Islamists. Opponents of Assad and Western countries accused his army of fighting against the forces of the secular opposition, although this area of Syria is an especially strong base for jihadists, including those from the Nusra Front group, who is excluded from the truce. According to Vitaly Churkin, Russia's ambassador to the UN, the truce in Aleppo was agreed upon as early as May 3, but was foiled by the opposition, who dealt a blow to Assad's army in the city. The West welcomed the ceasefire agreement. As U.S. Secretary of State John Kerry said, the U.S. expects that it will be adhered to by both the authorities and the opposition. According to German Foreign Minister Frank-Walter Steinmeier, the truce in Aleppo is a good foundation for the resumption of negotiations between the Syrian authorities and the opposition in Geneva, which were suspended some time ago. Lavrov, in this regard, suggested that someone was trying to use Washington in order to “take the heat off the Nusra Front” and said that Turkey could be behind this, citing information on Ankara’s “improper relationships” with the Islamic State and the Nusra Front. Aleppo has been divided between the warring parties for several years. Its western regions are under the control of government troops, while others are controlled by both rebels and jihadists. This was confirmed to RBTH by Sergei Demidenko, a Middle East expert from the Russian Presidential Academy of National Economy and Public Administration (RANEPA). According to Demidenko, there are too many opposing parties: in addition to the government troops, the main Islamist groups and the opposition, there are also formations of different ethnic and religious groups in the area. Moreover, all parties involved in the conflict have their own scheme of action and they rarely coordinate their activities with other groups. This “layer cake situation” determined the short truce period: in the chaos that reigns in Aleppo, it is impossible to agree on anything for a long time. At the same time, Demidenko said that both in Aleppo and in Syria as a whole, the positions of the nominally secular and moderate opposition from the Free Syrian Army (FSA) are weak. Islamists have much more influence. In addition, the expert emphasizes that the FSA is not a well-organized structure. It is a conglomerate of atomized organizations, which include, among others, a number of Islamist groups. This seriously hampers attempts to reach agreements with the FSA.